Triumph motorcycle photo shoot on location. 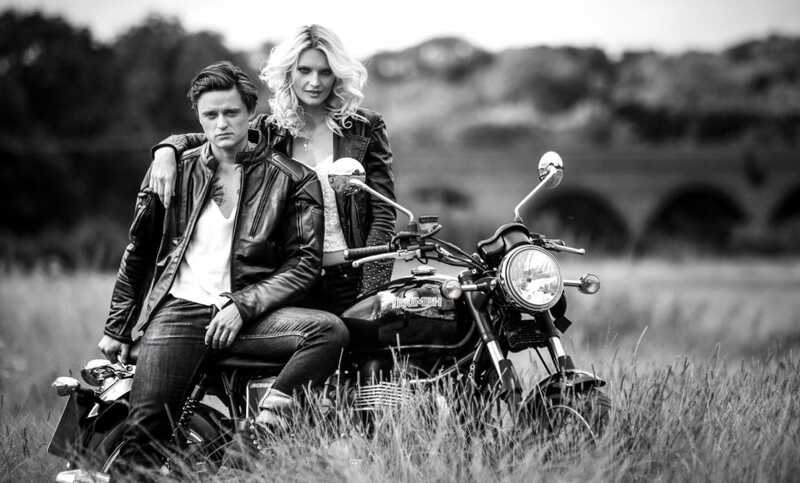 I had this idea of a motorcycle photo shoot in the fields in my mind for quite some time now and just a few days ago I have managed to put all the things together and now I can share a few words about it with you. In my head I knew exactly what I want and when I found out that my friend Martin Bella just bought this beautiful and very classic Triumph motorcycle I knew I have to take advantage of it. I contacted him right away and he was more then happy to help me my with the project. He also agreed to pose for me which was absolutely fantastic because I now had to only worry of one more model. The very next day I started to scout for a good location. I know that if it comes to location in London, there will be lots of problem from the start. Mainly because every where you go you need a permit or pay lots of money for it. So the only solution is to find some place outside of London. I have spent a few hours in the car driving around and found a great location in Lakeside just a few miles from East London with lots of open space, high grass and a bridge in the background and also it was very close to my studio which was very convenient for every one. Below image without using strobe. and here is the one with the strobe. I knew that this will be very interesting subject to shoot so I asked my friend Pavel Prijma if he would be interested to do some behind the scene video. I love the quality of his work and I highly recommend him for any job. To see more of his work just click on the link. Also, many of you may know that good picture is not work of just photographer but the whole team. Every person involved in the shoot is a part of it, and I would like to say a big thank you to Kasia Bober, Martin Bella, Pavel Prijma, Michal Gutowski and Sandor Nadasdi to be part of this one. To see more of my work just click on the link.